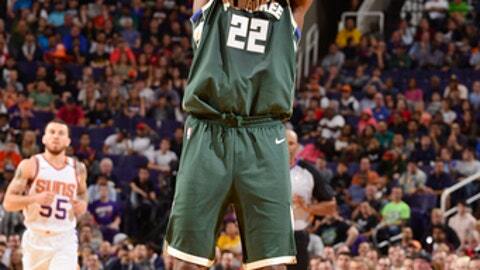 PHOENIX (AP) Eric Bledsoe expected the boos from Phoenix fans and he heard them. Amid the fans’ wrath for the way his time with the Suns ended, the veteran guard went out and had his best game as a member of the Milwaukee Bucks. Booker missed a chance to tie it with 7.5 seconds left in the extra session, and Middleton made four free throws to seal the Bucks’ ninth victory of the season. The teams played a back-and-forth final quarter with Phoenix leading by as many as four. Milwaukee tied it at 99 on Thon Maker’s jumper with 1:11 to play. ”I felt comfortable. I was just trying to be aggressive every time I touched the ball,” Monroe said. Bucks: Antetokounmpo is expected to return to action Saturday at Utah. ”His minutes have been a little high early on and we’ve got to look at our bench,” Kidd said. … The Bucks were also without G Matthew Dellavedova (left knee), F John Henson (eye procedure) and another former Sun, F Mirza Teletovic (left knee). … Second-year pro Gary Payton II made his first start of the season, but injured an ankle. Suns: F Jared Dudley (right knee) missed his sixth straight game. … Tyson Chandler got the start at center after the missing the past three games due to illness. … The Suns and Bucks are both in their 50th seasons as NBA franchises, and will will play each other in January on the 50th anniversary of the two cities being awarded teams.